Continuous Delivery may sequence multiple deployment “rings” for progressive exposure (also known as “controlling the blast radius”). Progressive exposure groups users who get to try new releases to monitor their experience in “rings.” The first deployment ring is often a “canary” used to test new versions in production before a broader rollout. CD automates deployment from one ring to the next and may optionally depend on an approval step, in which a decision maker signs off on the changes electronically. CD may create an auditable record of the approval in order to satisfy regulatory procedures or other control objectives. Without Continuous Delivery, software release cycles were previously a bottleneck for application and operation teams. Manual processes led to unreliable releases that produced delays and errors. These teams often relied on handoffs that resulted in issues during release cycles. The automated release pipeline allows a “fail fast” approach to validation, where the tests most likely to fail quickly are run first and longer-running tests happen after the faster ones complete successfully. Continuous Delivery is a lean practice. The goal of CD is to keep production fresh by achieving the shortest path from the availability of new code in version control or new components in package management to deployment. By automation, CD minimizes the time to deploy and time to mitigate or time to remediate production incidents (TTM and TTR). In lean terms, this optimizes process time and eliminates idle time. Continuous Delivery is helped considerably by the complementary practices of Infrastructure as Code and Monitoring. Continuously delivering value has become a mandatory requirement for organizations. To deliver value to your end users, you must release continually and without errors. 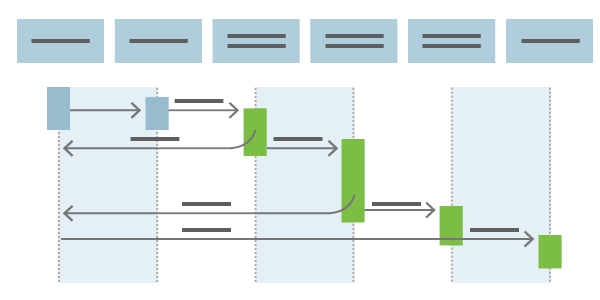 Continuous Delivery also supports two other patterns for progressive exposure beside sequential rings. “Blue/Green deployment” relies on keeping an existing (blue) version live while a new (green) one is deployed. Typically, this uses load balancing to direct increasing amounts of traffic to the green deployment. If monitoring discovers an incident, traffic can be rerouted to the blue deployment still running. “Feature flags” (or “feature toggles”) comprise another technique used for experimentation and “dark launches.” Feature flags turn on features on or off for different end users based on their identity and group membership. Modern release pipelines allow development teams to deploy new features fast and safely. Issues found in production can be remediated quickly by rolling forward with a new deployment. In this way, CD creates a continuous stream of customer value. Read more about the Continuous Delivery capabilities of Azure Pipelines. Learn how to set up Continuous Deployment to Azure. See how Bing is using Continuous Delivery with Azure DevOps. Sam Guckenheimer works on Microsoft Azure DevOps team. He acts as the chief customer advocate, responsible for strategy of the next releases of these products, focusing on DevOps. He has written four books on DevOps and Agile Software practices.